If you’ve been paying attention to the news lately, you may be feeling on edge. You may feel as though time is running out for you to get your preparedness supplies in order. You may be new to prepping, and feeling like there’s too much to accomplish. The stress in our country is at peak levels, as we watch the bumbling efforts of officials to contain the spread of Ebola, as the war drums beat louder, as riots break out again in an American city, as the economy freefalls, and as a terrorist group declares Jihad on anyone who doesn’t share their religious beliefs. This feeling of urgency can make you feel hopeless and panicked, and that’s not productive. There’s no time for a lack of productivity. It’s time to focus and create your food supply…fast. If an event occurs during which you are unable to leave your home, you want to make certain that you can do this without assistance. Such an event could be a mandatory quarantine, self-imposed isolation due to a pandemic, civil unrest in your town, martial law, or even a terrible storm that leaves you stranded, with no access to the store. However, if you do not have a food supply waiting in your pantry, now is the time to focus on creating an emergency stockpile quickly. You can then add healthier options at your leisure. The quantities in this article are per person, so you’ll need to multiply this by the number of people in your home. You can order these items online and get them to your door within a couple of days. However you opt to build your food supply, please don’t hesitate. If a worst case scenario occurred, the goal is to be able to feed your family for at least a month. These are purely subjective numbers, however. For example, if your family is gluten-free, you might eat more protein and produce than starchy carbs. You must take into account your family’s health concerns, special needs, allergies, intolerances, likes, and dislikes. These are simply guidelines. Try to stick as close to your normal eating habits as possible, to lessen the stress of an already highly-wrought situation. It’s also important to consider cooking times. If you never ever cook from scratch, will you suddenly want to make pots of beans and homemade bread? If the power goes out, will you have a way that you’ll be able to cook these foods? 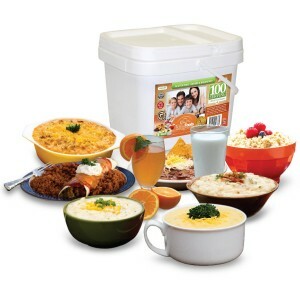 If you’re trying to build a food supply quickly, consider ordering a kit with a month’s supply of meals in it. These aren’t going to be the healthiest or tastiest meals, but they’ll stand between you and starvation. You may look at the prices of these items and say, “Oh, I can’t afford this.” But you have to remember, this is enough food for an ENTIRE MONTH. At $150, that means you’re spending only $3 per day on food. It honestly doesn’t get much cheaper than that. There’s a variety of price points below, with the pros and cons of each. You’ll notice on the list of extras that I recommended a gentle laxative. Some people, when dependent solely upon MREs or dehydrated foods, become constipated. I also recommended a high-quality multivitamin to help ensure you’re getting the nutrition you need. 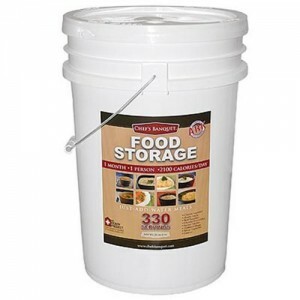 Relief Foods Premium 1 Month Emergency Food Supply seems to offer the most bang for your buck. 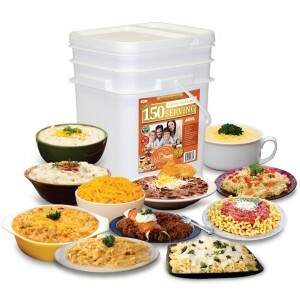 At $166, including shipping, this bucket contains 150 meals that are guaranteed to be GMO and MSG free. There’s more variety in this menu, but oddly, no breakfast-specific offerings. I wouldn’t be deterred by that, though, because breakfast is easily taken care of with powdered milk and dry cereal or oatmeal. 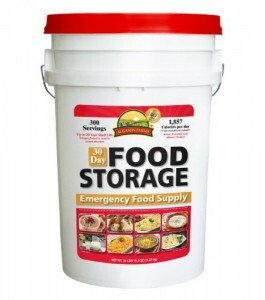 From the same company is the Relief Foods Gluten Free Emergency Food Supply Bucket . This is certified to be free of gluten, MSG, and GMOs. It only contains 100 servings, some of which are not meals. This bucket costs $112, including shipping. If you happen to have an LDS cannery or self-reliance store in your area, you’ve got a great resource. You can also order supplies online. These #10 cans are sealed and will last for 10 years or longer. 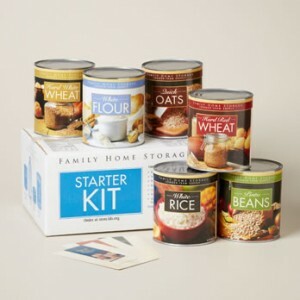 A 28 pound starter kit contains wheat berries, oats, rice, beans, and flour for only $33.50. 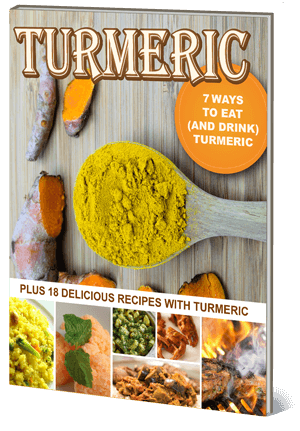 The downside to this is that most of the foods require extensive cooking times and would make for quite bland eating if you relied solely on this. If it’s in the budget, adding some fruits, vegetables, desserts, and dry milk can go a long way towards fighting food fatigue. Don’t forget to add an assortment of spices and condiments to make your emergency meals tastier. You don’t have to be a prepper to build a 30-day food supply. Up until recently, preppers have had something of a bad name in the media. However, as disasters strike America over and over, people are beginning to see the value in the way we do things. It’s been proven time and time again that when issues occur, you’re completely on your own. To learn more about basic preparedness, go HERE to learn how to get started.